Solid brass base with heavy silver plating. Small enough to be a perfect table accent. The perfect way to display those fresh picked spring flowers. Our swirl vase is virtually unbreakable and small in stature, making it a perfect accent for your desk, or any other small space. This lovely swirled vase is cast of solid brass which is then finished with a heavy silver plate. Stands 4 3/4 inches tall, and is 5 inches across at it's widest point. The top opening is 2 3/4 inches by 1 3/4 inches. Weighs 1 pound, 3 ounces. 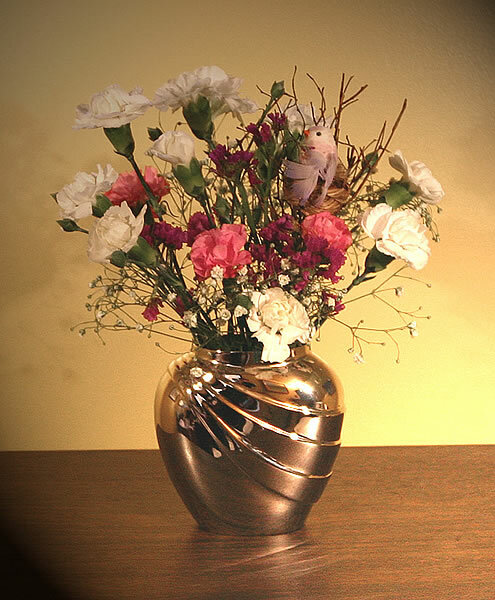 The vase is available in both Silver and Polished Brass. The silver is treated with an anti-tarnish finish to help keep a low maintenance shine. Also available in polished brass. We purchased this with our candlesticks. We placed them together on our cherry hutch. Lovely. Again, the service was great and the quality is top.